It is a helpful companion that can pull a tonne of weight. 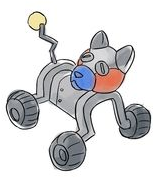 K9, the Cute tuxemon, is a Metal-type monster. Original design by Leo. Sprites by Sanglorian.